Merigala Gabriel’s main objective is to thoroughly examine subjective truth, which is the core concept in Kierkegaard’s philosophy. Here Gabriel contrasts subjective truth with objective truth in order to highlight the significance of subjective truth in its religious context and to bring out the inadequacy of objective truth. The principle of absolute paradox connected with the subjective truth is also discussed. The study also aims to present a detailed analysis of the aesthetic, ethical, and religious stages that represent existential dialectic, to examine their interrelationship and to show how the religious mode of existence is the key to genuineness in real existence. Care is taken to examine the disjunction between reason and faith: to bring out the importance of “faith” in Christianity and to show the limitations of science as far as Christianity is concerned. Gabriel also addresses the relation between God and Man. 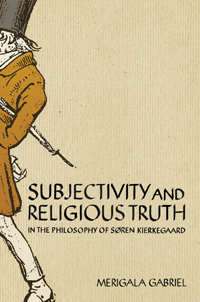 Finally, the importance of Kierkegaard’s thought and his contribution to the development of ”subjectivity and religious truth” are outlined.